and greens in many shades and hues swept across the land. 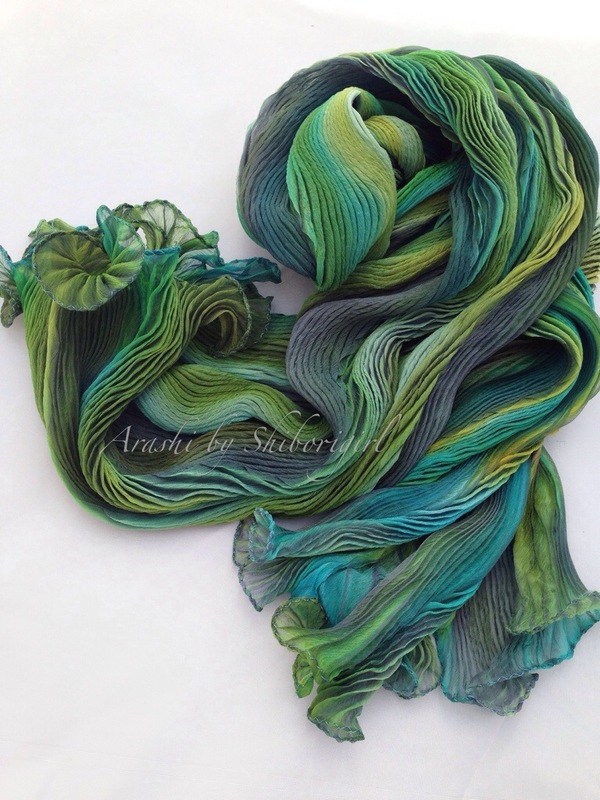 This entry was posted in arashi shibori, fashion, shibori and tagged arashi, color, colorway, shadows and greens, shibori, shiborigirl, silk on April 12, 2014 by shiborigirl. just a quick post to show you a couple of new pieces. when i began them i had in my mind’s eye what i wanted-almost. lots of what i do is like that. i have it about 80% worked out in my head. the last 20% comes as i am working on it. i learned a lot making them. i’m looking forward to making more of these in other colors. that will have to wait for mid november though. i’m adding these to the shop as shown and you can order the make me one option and we can talk about colors. this is arashi shibori now. 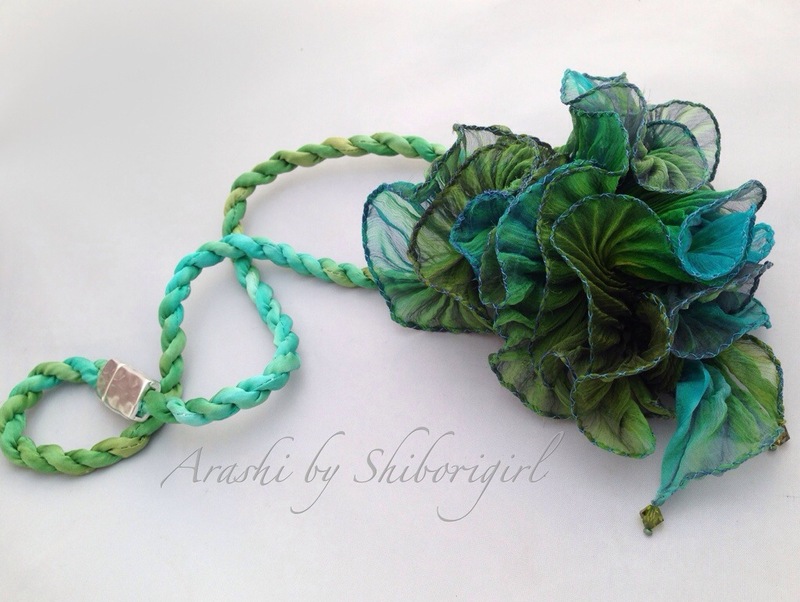 This entry was posted in experimenting, fashion, shibori, shibori ribbon, silk, where to find my shibori and tagged accessories, arashi, collar, contemporary, necklace, shibori, shiborigirl on October 1, 2012 by shiborigirl. I had a bit of time recently to just do some wondering and dyeing-and even some stitching. I wondered about collars as opposed to necklaces. -and I played around with some more needlefelting in combination with the ribbon and pleated silk gauze. So perfect-kind of a “back-to-school” message. I was reminded that the best learning is sometimes the learning that takes place when you’re not even aware that it’s going on. This is the sort of thing that I aspire to when I write on this blog. A balance of information and beauty while at the same time entertaining, teaching and working. So thanks Sofia, for the sweet reminder! 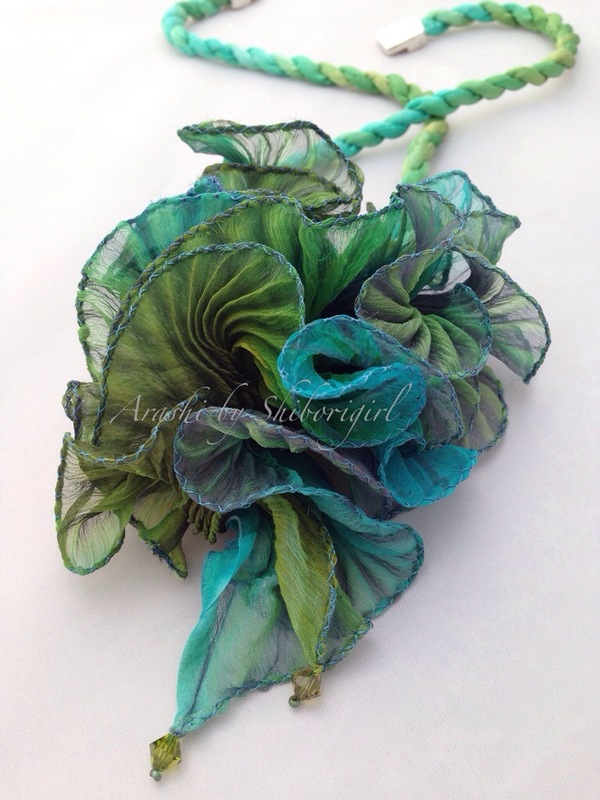 This entry was posted in contemporary shibori, fashion, shibori, shibori ribbon, silk and tagged bespoke shibori, bomaki, hand made, needlefelting, shibori collar, shibori ribbon, silk gauze on September 7, 2012 by shiborigirl. yes, silk shibori pocket squares. i don’t talk about them too often but like the ribbon, they are something that goes on in the background of making here. they are kind of self explanatory and you can see the the full details on my page devoted to them here on the blog. what i really want to write about today are the customers who purchase my shibori pocket squares. such an interesting group of men! yes, men like shibori too-and why not? Perhaps the most important one- women love them! Why? It indicates that you are interested in standing out and care about your appearance. Also, most women LOVE textiles. I have been told by men that the women can’t keep their hands off of these silk shibori pocket squares. They are intriguing (and a good conversation starter). They are fun to play with. I dare you to hold one in your hand and NOT be mesmerized by the colorful play of pattern and texture as you open and release the pleated silk. The sheer feel of the heavy silk charmeuse is luxurious. Another virtue of wearing one of my Silk Shibori Pocket Squares is that no two are ever alike! It’s an acknowledgement and appreciation for things still hand made and one of a kind. In this world of mass production, fast tracking, mega malls, and super stores there still is room for some things to remain small and slow and made by hand one at a time. Remember that, each time you tuck one of my shibori pocket squares into your suit pocket. so who are these guys? some of them are entertainers, pianists, economists, ARS furniture appraisers, CNN newsmen, grooms and their groomsmen, fathers of the bride, boyfriends, photographers, architects, stylists, designers, dads and grads, guys in suits from all walks who want to have a dash of flash. most recently, a reorder came from a fellow who is ordering a couple of pocket squares for his dad’s upcoming 85th birthday. apparently, dad borrowed one of his some time ago and refuses to give it back- gotta love that! so now, dad will have his very own set at 85! i really do enjoy making pocket squares for these guys. they seem to enjoy emailing me stories and color requests to match particular things in their closet. sometimes they just send me an order for 4-6 of them and say-“just surprise me!”. i have had some problems with making them however. this has caused me to reconsider how i am approaching their making. first off, i’ve been trying to make them as the orders come in and that usually means a few at a time. which also means that i don’t get the advantage of perfecting them over a larger batch of producing them. i was just getting too many sub-par squares (according to my standards). making them in between scarves and ribbon and indigo just doesn’t get me the quality i am looking to achieve. while some people despise making something over and over, i see it as an opportunity to perfect a technique (thinking of those gals in Arimatsu) and i’ve always enjoyed that challenge in making. so this weekend, i devoted myself to pocket squares and the stack of orders for them that have accumulated. one issue has been that since these are done on charmuese the fabric behaves a little differently than on the lighter silks i regularly pleat and dye. some of the pleating has been kind of hit and miss and i am stuck with a box of less than perfectly pleated squares (i aim for the Mary Poppins “practically perfect”). they will be chopped up and put into scrap bags for houston. secondly, i wasn’t happy with the discharge and dye penetration on some and the resulting overall dye pattern on others. more for the scrap bag. other little problems are the ever increasing price of silk and as prices for the blanks rise, they decided to decrease the size! so now the 11×11 squares are 10×10. 11×11 is better to me but OK. so i experimented with the 17×17 version that dharma carries. it’s ok but a lighter weight and while the discharge and dye process is fine it’s just difficult to get the pleating perfect on them. (or as perfect as i’d like). more scrap. overall this weekend i solved the two major issues that have been haunting me simply through practice and focus. and i’ve come to a couple of conclusions about restructuring the sales of these items. i’m going to work up an inventory of 30-40 pieces to keep on hand each month and devote a couple of days to restocking and custom orders. no more fitting them in here and there. pieces in regular inventory will remain the same price ($24.95) but pieces that are custom ordered will cost a bit more. and i’m going to also add them to my big cartel shop-soon (in the next day or so). in the end, devoting a larger block of time to them is really the way to go and this will allow me to keep the price the same AND allow me to ship them quicker (win for the customer!). custom orders will still be available at an upcharge and will be produced during “pocket candy days”. i was happy with all of the last batch (finally!) and they are still made one at a time by hand- just all day long! i have had a pocket square facebook page for over a year or so but just never did anything with it…going to start updating that too. i see a number of my friends adding themselves on there to get updates as they occur. now to get busy and get the inventory made and photographed…. This entry was posted in arashi shibori, dyeing, experimenting, fashion, pocket squares, shibori and tagged men's fashion, pocket squares, shibori, shiborigirl, silk on September 6, 2011 by shiborigirl.